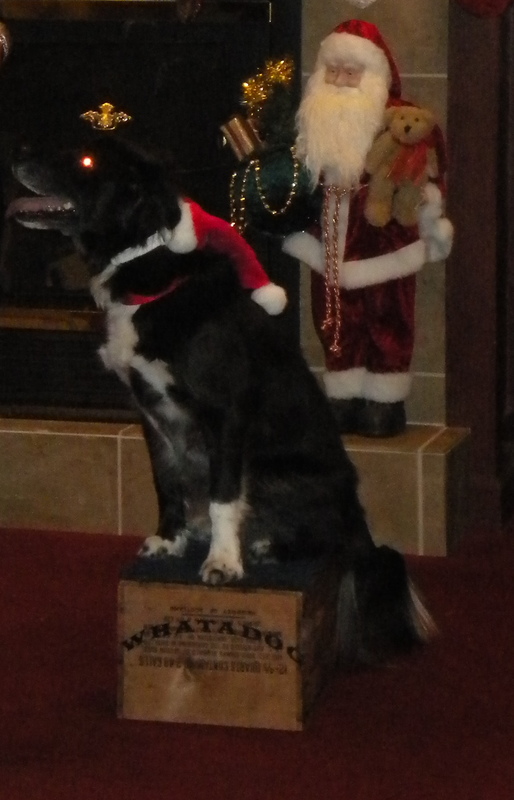 Toula Remembered the Reason for the Season-did you? It was the day before Christmas 2009 and all through the town people were shopping and scurrying around in hopes to find that perfect gift for their loved one. The snow did not stop the shopping, although it was treacherous outside, finding the perfect gift was on everyone’s mind. That is, except Toula. She already had the gift, the joy in her heart and cheer to spread. Not to those she knew or had even ever met before- strangers, to her but the most important people in her world that day. She was on a mission to put her talent to good use and put the reason into the season. She was groomed and ready to go by noon on Christmas Eve, donning her velvet red and white Santa hat, I buckled us into the sleigh and traveled where too few have traveled before on Christmas Eve, Bickford Cottage. Bickford Cottage specializes in assisted living and memory care. 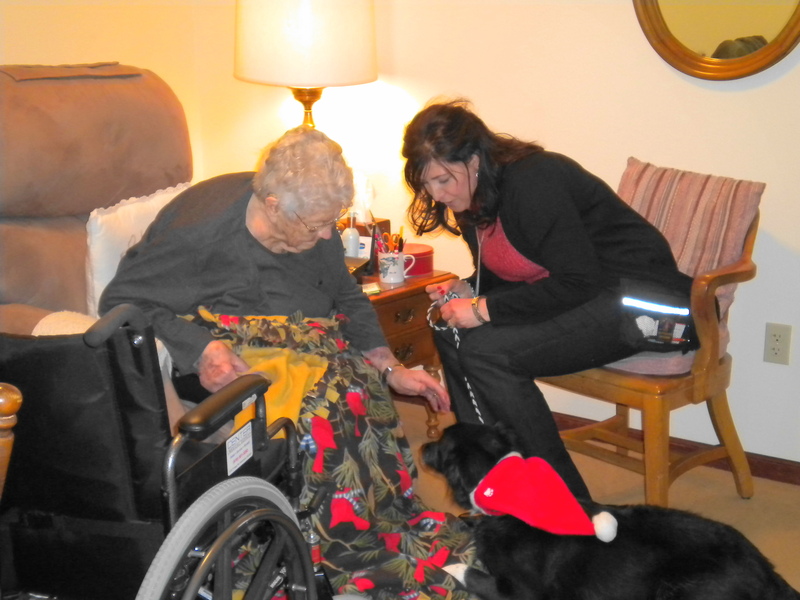 It was there that she gave strangers her gift; spread her joy and endless amounts of cheer to all the residents. When arrived at the Cottage, we were greeting by a roomful of people happy to see a new face, after all, it was Christmas Eve. If the people in the room weren’t dog lovers before we arrived, they were when we left! They were gathered in the large living room, patiently awaiting the “Movie Star”, “America’s Most Talent Pet”, the “Therapy Dog”, the “Rescued Dog” and to me, simply my best friend, Toula. My best friend and I had arrived to offer joy, laughter and a bit of holiday cheer to people that were truly deserving of our time. 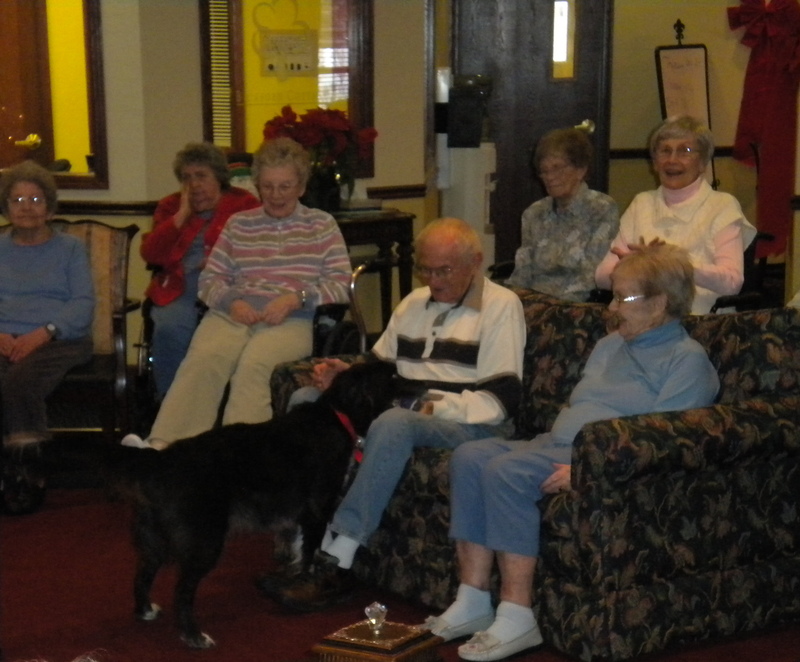 As Toula took her time to greet each and every person in the room, it was as if her wagging tail spread magical dust that came over the group- the smiles got bigger and soon laughter filled the room. Toula’s happiness was contagious. Toula entertained the crowd and put on a little show consisting of just a handful of the numerous behaviors she knows. On that day it really wasn’t so much about the show as it was to share Toula’s affection with others. As our time progressed at the Cottage, she took it upon herself to pick out the very special people she thought needed just a little extra attention that day, a little extra love and within minutes she had them engaged in conversations only the two of them understood. As I looked around the room, I saw nothing but smiles, and they never took their eyes off Toula. If they were lucky enough to make direct eye contact with her, she made sure to acknowledge them with a quick kiss and then got back to entertaining. During our visit, I got to hear many wonderful stories and memories of dogs that have been an important part of so many lives. Despite the aging process and perhaps a bit of memory loss, the memories they shared with me about their dogs’ were as clear and vivid as something that occurred only yesterday. As they shared their stories, Toula handed out kisses as though she was Santa handing out candy canes. She embraced the residences and they gave her plenty of pets, hugs and kisses back. Our time at the Cottage on Christmas Eve was limited, but the joy and happiness that Toula brought to the residence was something that one can not buy at a store, it needs no fancy wrapping paper, it is not limited by dollar amounts or size. The strangers we meet that day quickly became individuals that Toula and I are now proud to call our friends. Visiting those who are in nursing homes, assisted living facilities or specialized medical facilities during the holiday season is one of the most rewarding and special gifts anyone can give; the gift of your time is priceless. A special thank you to the staff at Bickford Cottage for welcoming us with open arms and also a very special thank you to my very own Santa’s Elves, Mechelle and Kasey, they helped with props and making the show on the road possible on Christmas Eve. 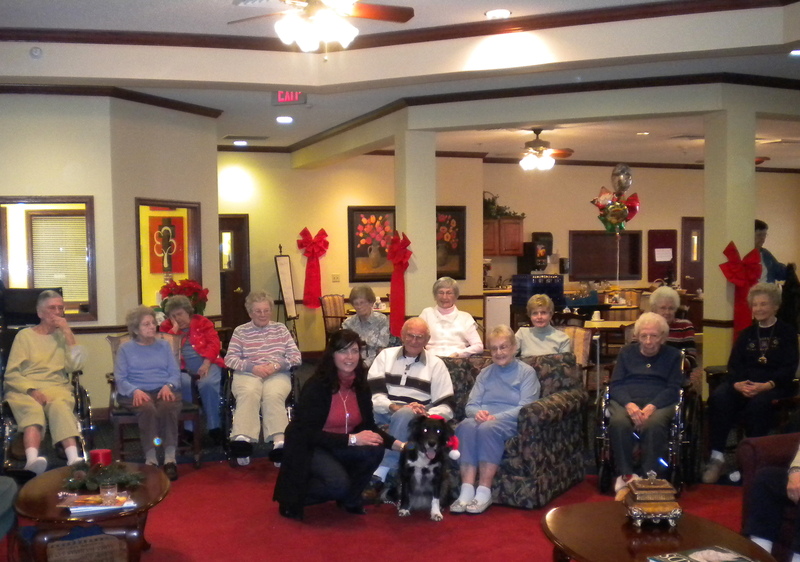 Posted in Toula, volunteering, WHATADOG | Comments Off on Toula Remembered the Reason for the Season-did you?